This wonderful art piece was fabricated and installed in 2015. “Day of the Dead Bench” is functional and enduring memorial for two of Wes’s friends and fellow artists -Michael Baxter and Samantha Young. Both Michael and Samantha had passed away from tragic and accidental overdoses that occurred over a year apart, and both families wanted to build a testament to their loving memories of these young people. Wes Horn’s fabulous artistry and use of the Dia de Muertos theme fun across the surface of the bench, and symbols that represent the two young people and their art are incorporated throughout. 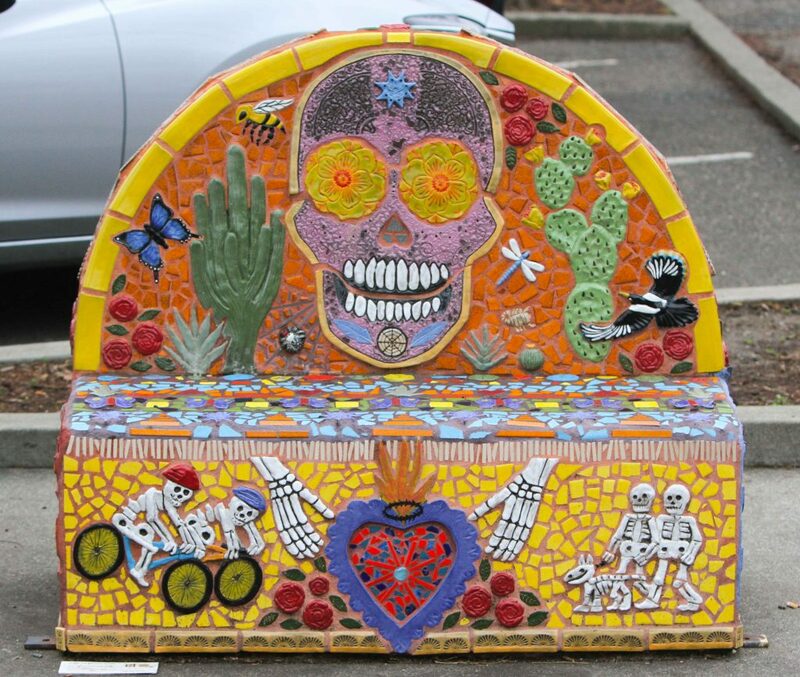 The Day of the Dead bench reminds the community to celebrate one’s loves past and present in a truly touching and functional art work.